What is lasagna? Lasagna is a classic dish of Italian cuisine, which is very popular around the world.Lasagna is easy to prepare, and the recipes are so diverse that it is difficult to resist in order not to cook this dish.Replace the stuffing for another one – and you have a new dish.For lasagna can be prepared meat, vegetable or mushroom stuffing.Each layer is preferably sprinkled with Parmesan cheese.Lasagna has become a symbol of Italy, along with pizza and pasta. Beneficial stresses and emphasizes the taste of lasagna sauce “Bechamel”, without which it is impossible lasagna! To cook classic lasagna recipe you’ll need the following ingredients:2 tablespoons olive oil,2 tablespoons vegetable oil,3/4 pound top round(wholesale cuts of beef,ground)1/2 pound Italian sausage,skinned and sliced,2 onions(finely chopped),2 cloves garlic(minced),2 tomatoes(peeled and coarsely chopped),2 cans tomato sauce,3 tablespoons sugar,1 tablespoon salt,,1 tablespoon fresh oregano or 1 teaspoon dried,1 tablespoon fresh basil or 1 teaspoon dried,1/2 grated Parmesan cheese,1/4 teaspoon freshly ground black pepper,1/2 lasagna noodles,1 pound Ricotta cheese,1 pound Mozzarella cheese(grated)1/4 pound grated Parmesan cheese. Heat the olive oil and vegetable oil in a heavy saucepan.Add the beef and sausage and saute until browned.Add onions and garlic and sate for 3 min more.Add tomatoes,tomato sauce,sugar,salt,oregano,basil,1/2 cup Parmesan,and pepper.Mix all ingredients well.Bring to a boil,reduce heat,and simmer slowly for 2 hours,stirring occasionally.When the sauce is almost finished,fill a large kettle with water,salt,and tablespoon of vegetable oil.Bring to a boil and add the lasagna noodles.Let the water come to a boil again after each addition.Simmer for 15-20 min then drain and rinse with hot water. In the bottom of greased baking dish put a thin layer of sauce,the a layer of noodles and then a layer of cheeses.Repeat these layers twice,ending with a layer of sauce,and sprinkle with Parmesan cheese.Bake at 350F(277C)for 40-45 min. and let it stand for about 15 min before serving.You delicious classic lasagna recipe is ready!This recipe makes enough for 8 servings.If you have 4 persons,Bake classic lasagna recipe in 2 smaller dishes and freeze one for busy day. Always stay with me and with my new recipes. 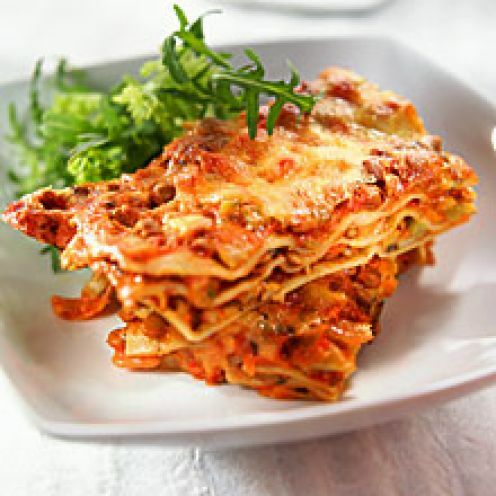 Posted on May 12, 2012 May 13, 2012 by The Best RecipesPosted in MeatTagged cheese, cloves garlic, cook lasagna recipe, dinner, food, lasagna, lasagna recipe, sauce bechamel, tomatoes. This sounds a lot like my mother-in-law’s recipe! I have to say it’s well worth taking the time to make it! Thanks for sharing it! BTW, it goes well with a garlic bread or toast made in the oven while it’s still hot.